Importing the content, widgets and menu is a three step process. First you import the ready made web pages. Then you import the widget settings. Finally you enable the menus. Tools → Import → WordPress → Choose File → Select the .xml document that has been made specifically for your theme. Click the Upload File and Import button. You will now see a drop down list labelled, assign posts to an existing user: Choose a user from your website who will own these new pages. Tick the box labelled: Download and import file attachments. The demo web pages have now been imported into your new site. Tools → Widget Importer & Exporter → Choose File, navigate to and select the file with a .wie extension. WIE (widget importer & exporter files) are made specifically for each individual theme. These widget import files will not work properly on any other theme. They only work properly on the theme they are made for. So make sure you’ve got the right one. 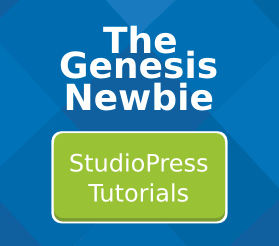 The StudioPress demo content includes posts, pages and navigation menus. In the Menu drop down, choose a Menu. You now have a basic website set up to look similar to the StudioPress demo site. Just edit the content to make the site your own!